Tom Fort looks over the steel door of the gallows inside the 1910 Hidalgo County Jail as renovations continue Friday, July 13, 2018, at the Museum of South Texas History in Edinburg. Only one man, Abram Ortiz, was hanged in the old jail in 1913. EDINBURG — Visitors to the Museum of South Texas History may soon begin experiencing flashbacks as its oldest structure is restored to its original condition. 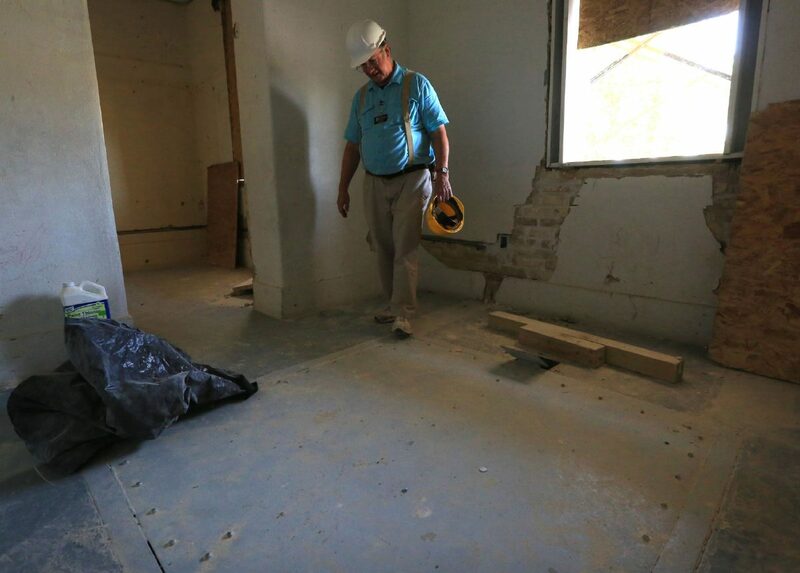 Located at 200 N. Closner Blvd., across from the Hidalgo County Courthouse, the two-story, 8,000-square-foot building, which was once the county jail, has been undergoing a thorough revitalization since February. The old jail section of the museum has been closed to the public since 2012 after it was deemed unstable. This is because moisture for years seeped into the structure and degraded the building, as well as undergoing wear and tear throughout the years. Tom Fort, senior historian and operations officer, along with Shan Rankin, executive director of the museum, walked through the dark rooms of the structure as the renovation progressed around them. 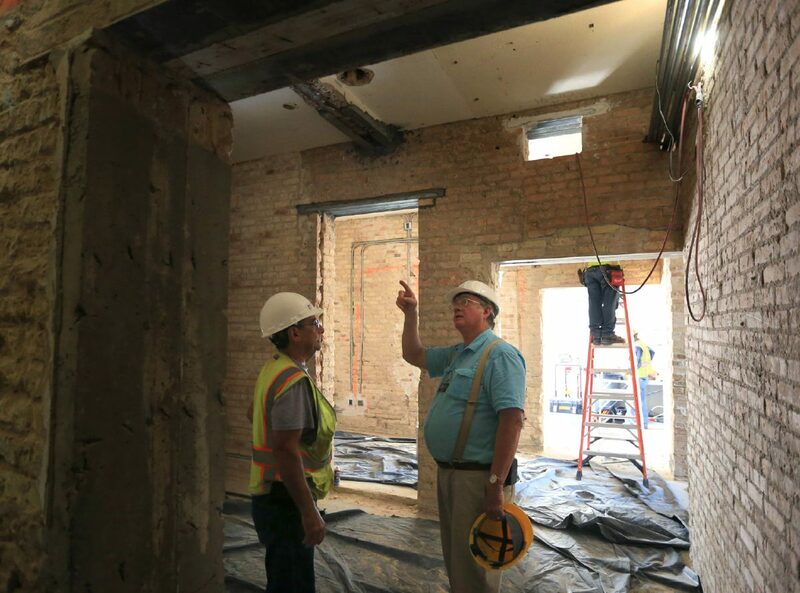 Museum of South Texas History's Tom Fort, right, talks with construction foreman Pilo Garza about the progress of the renovation of the old 1910 Hidalgo County Jail on Friday, July 13, 2018, in Edinburg. 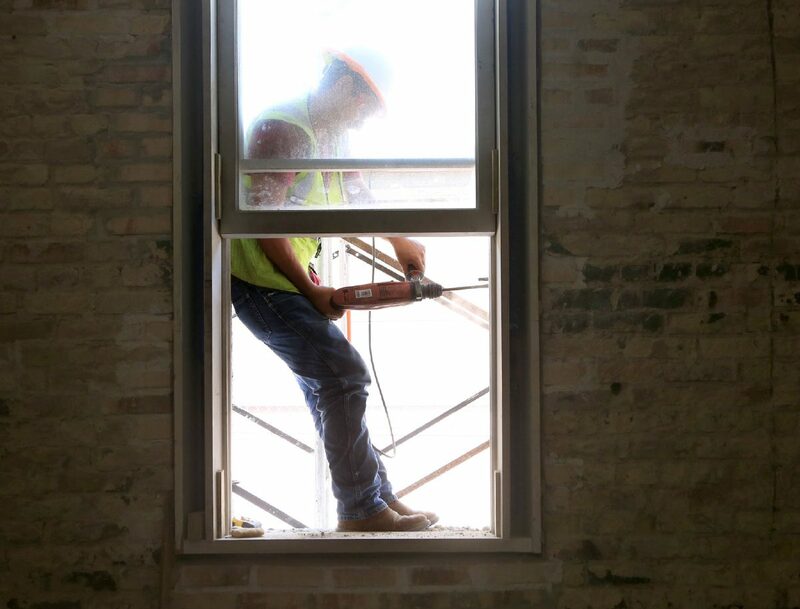 Rey Limón drills a hole in the brick of a window of the 1910 Hidalgo County Jail while the structure is renovated Friday, July 13, 2018, at the Museum of South Texas History in Edinburg. The demolition work was conducted in 2017 and was completed by the time the architect and structural engineer arrived. They reviewed the structure before any work could begin. The structural engineer checked the integrity of the original steel beams, and in particular their connection to the brick walls, to determine any corrosion, including to the concrete floors, and removal of the air conditioning ducts. “We did that work, which was then used to refine the drawing,” Rankin said. The renovation is being done by Wilson Construction Company. Some of the history of the building has been lost, such as the means particular rooms were utilized during its time as a jail. “We don’t know and we have no architectural drawings and no original diagrams at all, so there’s nothing that could tell us,” Fort said. Fort added that the door is placed directly facing the old courthouse, which was torn down in the 1940s, and used so the prisoners could be walked to trial and back. Rankin is anxious for the renovations to be completed. “I’ve taken this building as architecturally abused because it’s been through a series of lives,” Rankin said. “It was a jail, city hall, fire department and a community house. We’re supposed to be through in December, they’re about more than half done now. The landmark structure still has one original steel door, which may have been for the holding cell. “At least some of the building’s history is really coming alive now that’s been hidden for so many years, which is really pretty cool,” Fort said. After the building is finished, exhibits will be placed and ready for public display in 2019. Since 1967, the museum has only had three renovations. The renovation in 1969 was when the city purchased the building and turned it into a museum. In 1995, the space underwent a minor renovation because funding for a full makeover fell short. This is the building’s first full overhaul. “You find how much it’s going to cost to do the job and what you’re going to need, and we worked to develop that number, and we worked with the board committee and the board determined we’re only going to try to do the jail and nothing else,” Rankin said. The city and county are contributing to the renovation with funding as well as some national foundation grants. The Texas landmark began its life as the county jail in 1910 and was used in that role for about a decade. Only one official execution was recorded at the jail, although another prisoner hanged himself before his execution date. On Saturday mornings before noon, the admission fee is waived and the public can enjoy the museum for free.